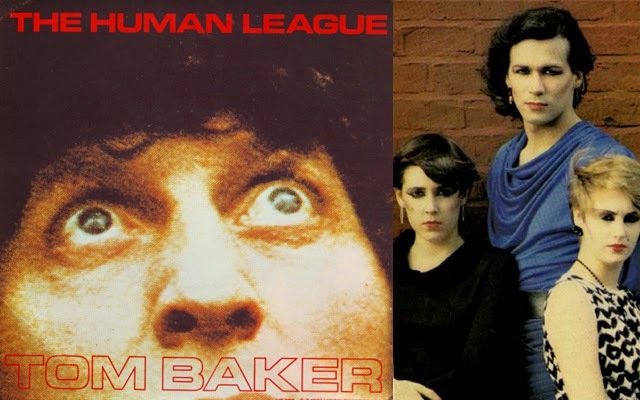 Remember that time The Human League released a song about TOM BAKER? | Warped Factor - Words in the Key of Geek. Remember that time The Human League released a song about TOM BAKER? There have been many tributes/references to Tom Baker's era as the Fourth Doctor in wider popular culture, but we're about to explore one of the longest-forgotten- even by the Human League themselves! "The recording entitled Tom Baker is heavily influenced by the incidental music of Doctor Who at the time. This should come as no surprise given that the League were given a private tour of the Radiophonic Workshop during the closing of the Baker era. Fans of pop culture such as Captain Scarlet and Doctor Who, the Human League even used imagery from the series in their live performances." Michael Newton reinforces this impression in a piece for The Guardian in his observation that "The band anyway had always sounded a bit like the BBC's Radiophonic Workshop". But the League line-up which released Tom Baker was vastly different by the time they first gained a measure of chart success with Don't You Want Me in November of the same year. The duo who originally put the group together had quit to form Heaven 17, Tom Baker marks a transitional phase between the League Mk1 and the League Mk2. Adding another member, Adi Newton, & indeed another synthesiser- the Roland-System 100- to the line-up, a change of name was next on the agenda. The trio became 'The Future', & it wasn't until 2002 that we would be allowed to hear their music thanks to the demo compilation The Golden Hour Of The Future. Soon after the recordings were made Newton left to form his own outfit, Clock DVA, who would later be cited as an important early force in what would come to be known as industrial music following the release of their 1981 cassette début Black Souls In White Suits. "We really liked the idea that punk had brought that you didn't have to have been to music school. There were instruments being produced that meant you could learn at your own pace. You could put the notes in then play them back at any speed, rather than having to have very fast hands.I think the main point was that anyone in our band could do anything. Anyone could've done the drums, anyone could do the singing, anyone could've done the bass." And they had a famous fan too, David Bowie going so far as to call them“the sound of the future”! "It was such an exciting time, again, because of what punk had started. There was a very vibrant live circuit and early on we brought in an AV thing, using a collection of slides, which people weren't doing yet. People like Hawkwind had done psychedelic colours and lights, but we put images to it. I think Bowie was impressed with that." "When we started out with our two basic keyboards bought on hire purchase, the Radiophonic Workshop represented a kind of dreamland, this magical place where any sound could be made. If someone had said back then 'you could give up everything you've achieved and become part of the Radiophonic Workshop, just click your fingers', I think we'd have done it. That's how in awe of all that stuff we were." Keynote sounds - This is a musical term that identifies the key of a piece, not always audible .. the key might stray from the original, but it will return. The keynote sounds may not always be heard consciously, but they "outline the character of the people living there". They are created by nature (geography and climate): wind, water, forests, plains, birds, insects, animals. In many urban areas, traffic has become the keynote sound. Sound signals - These are foreground sounds, which are listened to consciously; examples would be warning devices, bells, whistles, horns, sirens, etc. Geophony - Consisting of the prefix, geo ( ''earth''), and phon (or. ''sound''), this refers to the soundscape sources that are generated by non-biological natural sources such as wind in the trees, water in a stream or waves at the ocean, and earth movement, the first sounds heard on earth by any sound-sentient organism. Biophony - Consisting of the prefix, bio (gr. life) and the suffix for sound, this term refers to all of the non-human, non-domestic biological soundscape sources of sound. Anthrophony - Consisting of the prefix, anthro (gr. human), this term refers to all of the sound signatures generated by humans. Experiment for yourself- cue up a playback of Tom Baker and see if it syncs with any episode from his seven-year run as the Doctor! If it does, make sure you let us know.